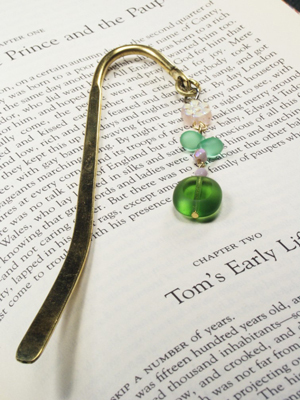 For the readers on your Christmas list, a beaded bookmark is an attractive, homemade gift that’s sure to be appreciated. Make this beaded bookmark as simple or as extravagant as you wish, depending on the beads or charms that you select. Slide the large flat rectangle onto the headpin. Slip on a round pink bead. Using your flat-nose pliers and round-nose pliers, begin making an eye loop. 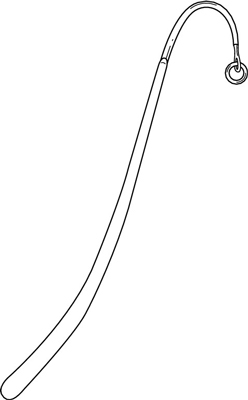 Before you close the loop, slide on one eye pin. Close the loop. Slide the last pink bead onto the open end of the eye pin. Follow it with the two green fringe beads. Using your flat-nose pliers and round-nose pliers, begin making an eye loop. Before you close the loop, slide on one eye pin. Close the loop. Slide the flower bead onto the open end of the last eyepin. Using your flat-nose pliers and round-nose pliers, make an eye loop. Set aside. Gently open the jump ring. Slide the beaded component you completed in Step 3 onto the jump ring. Connect the jump ring to the bookmark finding.